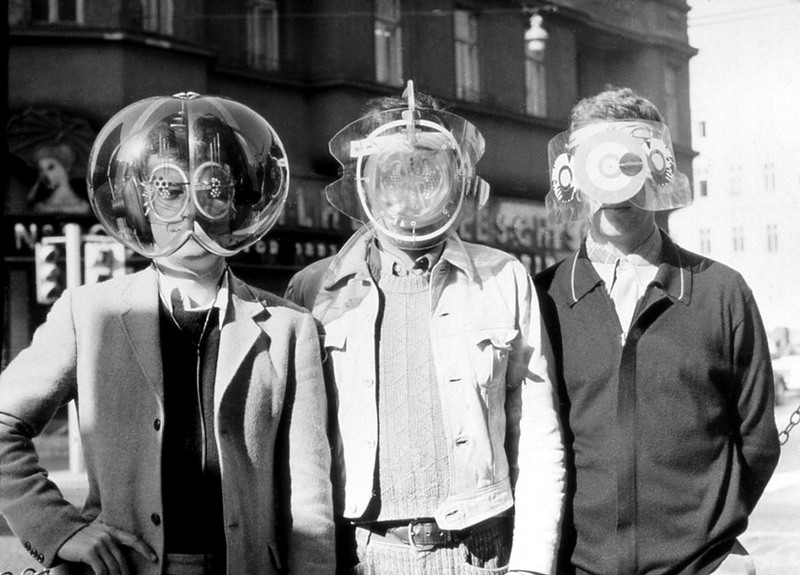 Haus-Rucker-Co were a Viennese group founded in 1967 by Lauridis Ortner, Gunter Zamp Kelp ad Klaus Pinter, later joined by Manfred Ortner, who used architecture and prosthesis to create altered perceptions of space and situationist critique of cities and utopian thinking. Their Mind Expander works propose to facilitate mental change through bodily prosthetics and social interventions via performative-architectural sculptures. Their work sought to work with altered states and psychedelic communion. Mind Expander I extends the cyborg (‘psi-borg’ and ‘cyberpathic’) telepathy of Marcel Duchamp’s Large Glass by using transparent materials with metallic layers and geometric patterns on a transparent surface. Clear transparent inflatables are a big part of Haus-Rucker-Co’s aesthetic signature and in Mind Expander I the clear plastic bubble resembles a bulbous cybernetic fly head. The seat fixes two persons in a certain position, one with legs crossed over the legs of a person with legs sitting apart. Where the lower seat allows one person to sit with their legs slightly open. A clear brain-like helmet and balloon hovers out of a cylinder over the seated people. Lines and shapes of reflective foil on the dome and balloon surface constantly overlay each other to form shifting patterns when perspective of viewers shift. Their Flyhead (Environment Transformer) Helmet consists of two transparent green, symmetrical, hemispherical plastic bulbous forms partially covered with foil, and it contains audio-visual filters. Haus Rucker Co’s work with mind expansion literally attempts to modify minds, and points to growing interest in mind control technologies and psychedelic experience of the 60s.